On August 11th, 2016, Nickelodeon announced that they had greenlit a one-hour TV special for the 1990's classic, ROCKO'S MODERN LIFE. 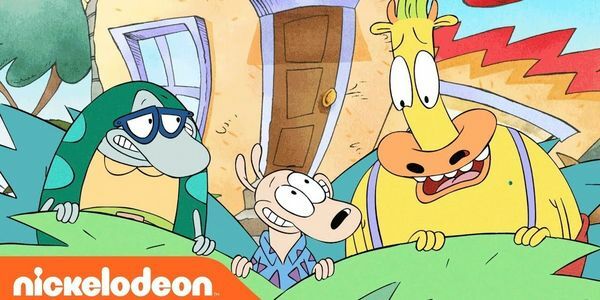 In the TV movie, Rocko and his friends came back to O-Town after being in outer space for 20 years, where they attempt to conform to an even more modern life. A sneak peek debuted at Comic Con in July 2017 before finding its way onto YouTube. Production on the special officially wrapped on February 8th, 2018. However, no further news regarding a release date has been revealed. On September 24th, 2018, creator Joe Murray gave a slight update about the lack of news surrounding the special's release. He did not confirm or deny the rumors of the special releasing on streaming, stating he was "sworn to secrecy". Earlier that same month, in reply to a tweet about the same topic, Murray stated that there were "actually some thing [sic] going on behind the scenes that I think everyone will be happy about that is delaying the airing of the special." On February 4th, 2019, Joe Murray was asked about the whereabouts of the film on Facebook. He said he is "praying that Nickelodeon haven't abandoned the film" due to the many executive changes the company has had during the past year, and also stated he has not heard anything about a set release date since. This news has outraged many fans of the series who are still waiting to see the special. If fans were able to help convince Nickelodeon to finally greenlit HEY ARNOLD! : THE JUNGLE MOVIE, why can't we try to convince them to release ROCKO'S MODERN LIFE: STATIC CLING? Just think of this amazing opportunity to introduce a classic Nicktoon to a new generation of kids. Especially given that their parents might've been the ones who grew up watching the original series in the first place. Whether it would be on the main network or on a streaming service, the world deserves to see all the hard work that went into the special. Creator Joe Murray has recently revealed in a comment on his official Facebook page that Nickelodeon will supposedly be announcing news about ROCKO'S MODERN LIFE: STATIC CLING soon. Whether it's good news or not, please keep on signing and/or sharing this petition to let Nickelodeon know how much we want this special to be released to the world. Rumor has it that Jhonen Vasquez, the creator of INVADER ZIM, revealed on a blog that both ENTER THE FLORPUS and STATIC CLING will be going straight to Netflix in 2020. However, this is a hoax being spread by someone impersonating Jhonen.